São Tomé (Agenzia Fides) - After leaving Angola on the evening of Sunday 18 November, Cardinal Fernando Filoni arrived in São Tomé to conclude his pastoral visit for the 50th anniversary of the Bishops' Conference of the two Portuguese-speaking countries, CEAST (see Fides, 9/11/2018). 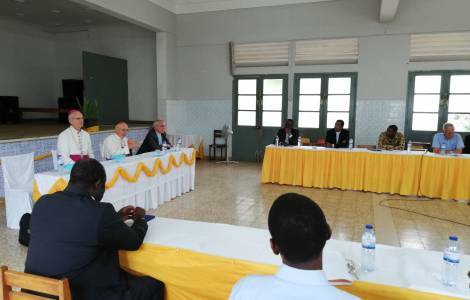 During the two days spent in the archipelago, November 19 and 20, the Prefect of the Congregation for the Evangelization of Peoples has scheduled a series of visits and meetings with the different realities that make up the small local Church of São Tomé: 201.000 inhabitants of whom 115,000 Catholics, 2 Bishops of whom one is emeritus, 13 priests between diocesan and religious, 31 nuns, 472 catechists. "I urge each of you, from the Bishop, to diocesan priests, consecrated men and women, and to the whole people of God of São Tomé, to live the dimension of the "the Church that goes forth" as authentic 'missionary disciples'. Each of you can say, like Saint Paul: 'Woe to me if I do not evangelize'." This is the invitation that Cardinal Filoni addressed to priests, nuns, missionaries, representatives of lay movements and the parishes of São Tomé whom he met yesterday. Addressing priests, diocesan and religious, Cardinal Filoni recalled that "the priest is a fundamental part of the project of evangelization" and urged everyone "to fall in love with the Gospel, to challenge and to provoke the ever-present charm of the figure of Jesus, through his words and his gestures of love, to live today and now, the joy of the Gospel and to commit oneself to becoming authentic missionary disciples". He also urged men and women religious to be "missionary disciples", "to continue with your charism and your apostolic zeal to help this Church grow. I would like to remind you, as the Holy Father did on 4 May, of the three authentic criteria, pillars of consecrated life: prayer, poverty and patience". Thanking the laity for the pastoral service rendered by various apostolic movements present in the diocese, he emphasized: "Many catechists, animators of communities, generously dedicate themselves to proclaiming the Gospel, but I ask each of you to commit yourself ... it is not a task exclusively of priests, religious men and women, of catechists, but it belongs to all of us".